Paderborn – Amid all the tension and emotion of a relegation battle, SC Paderborn midfielder did not lose sight of the bigger picture as he made a particularly warm dedication to a team-mate after firing his side in front against SV Werder Bremen on Matchday 30. After opening the scoring in the 25th minute with a stunning volley from a corner, Vrancic immediately raced over to the home bench. There, he took the number 26 shirt belonging to his colleague and held it aloft with his team-mates. 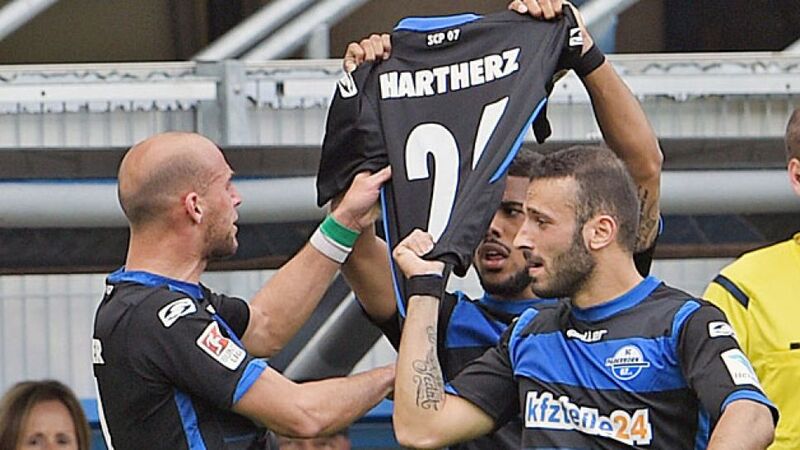 Hartherz's father had died unexpectedly at the age of 53 on Saturday and the gesture was a sign of solidarity with the defender in his time of mourning. "It would have been really fitting if that goal had been enough for victory," said Vrancic afterwards. However, despite Moritz Stoppelkamp doubling the hosts' lead two minutes later, Bremen fought back and eventually levelled the scores at 2-2, leaving Paderborn second bottom in the standings. See Vrancic's moving celebration in this video, courtesy of the Bundesliga's YouTube channel.